The family history book appears to suggest that the name Drury was not used until the 14th century at least, although FitzDrieu gradually became FitzDruri. 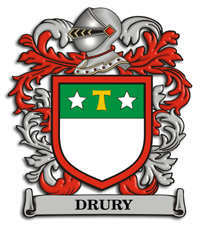 We use Drury as the family name for generations from here on largely for the sake of simplicity. -2 Alice de Clopton b c 1410 Long Melford Suffolk m John Harleston b 1403 Sudbury Suffolk d 1456 -1-1 Anne Denston b 1435 Kentwell Suffolk d 30.05.1481 m John Broughton b 1442, Lancashire England d 10.10.1479. Sources: 'The History of the Family of Drury in the counties of Suffolk and Norfolk from the Conquest' by Arthur Campling, 1937.